Basilica di San Pietro is the mother church of the world's one billion Roman Catholics. This Vatican City house of worship is one of mankind's supreme artistic-architectural accomplishments. St Peter's Basilica was erected some 500 years ago over the foundations of the old St Peter's Basilica, which was built in the 4th century over the tomb of St Peter. Many great minds in the first 100 years (beginning in 1506) designed St Peter's Basilica, yet the composite result is so elegantly harmonious that it seems to be the inspiration of a single genius. Of all its creators, Michelangelo made the most significant contributions. Not only did he sculpt the graceful Pieta marble statue and designed the stunning 133-meter (435-foot) high dome, he served for nearly two decades as the chief architect of St Peter's Basilica. Another key contributor was Bernini. 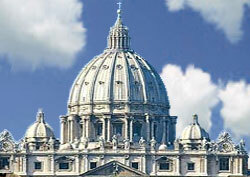 He designed the magnificent altar canopy as well as the authoritative frontal facade of St Peter's Basilica. The quadruple colonnades that stylishly line St Peter's Square (actually an ellipse) were also Bernini's creation.